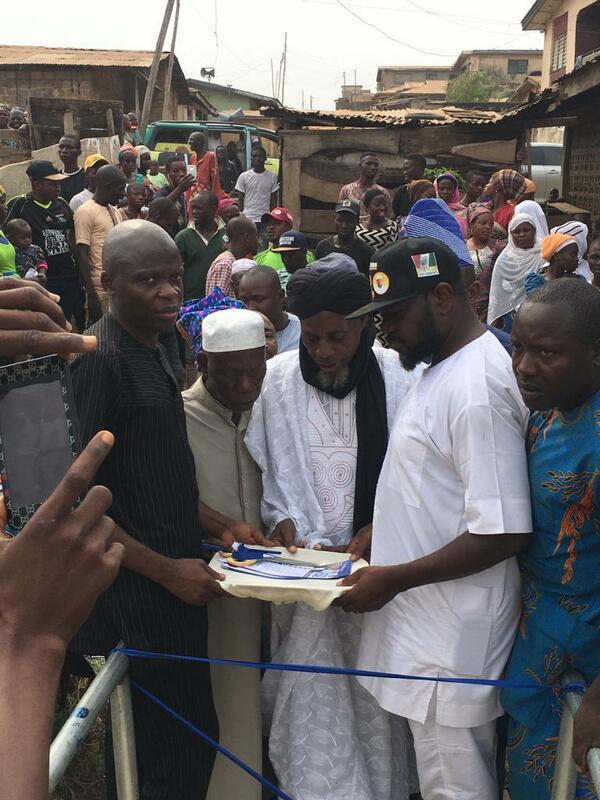 The people of Alubarika and Araromi communities in Odinjo in Ibadan South East, Oyo State were, on Friday, February 8, 2019, were in jubilant mood as a candidate contesting for Federal House of Representatives, Ibadan North East/South East in February 16 election, under Zenith Labour Party, Semih Alao, constructed a pedestrian bridge that links the two communities. The Sun gathered that for many years ago, a river that divides the communities has been making life hellish for residents of the communities because any time it rains and water fill the banks of the river, the pedestrians do walk over 2 kilometers of roads as alternative route to get to other community, because there was no pedestrian bridge to walk over the river. Also, because the river is dirty, some members of the communities who walk inside the water reportedly contract water borne diseases while some have died from these incommunicable diseases. Beside this, there are dangerous creatures in the water that can hurt the passers, Daily Sun gathered. According to landlords and landladies in the communities, they have written letters to the governments explaining challenges they were facing due to lack of pedestrian bridge but all their complains fell on their deaf ears. The landlords and landladies who claimed many of them are not buoyant to afford the construction of the bridge said they have approached many philanthropists but none of them hearkened to their complaints. But in an appreciation message from the landlords and landladies, they thanked the son of late Aare Musulumi of Yorubaland, Alhaji Arisekola Alao for coming to their rescue to construct the bridge. According to them, the entire community of Fidi Layout under the control of the landlord association thank Hon. Semih Alao for constructing the pedestrian bridge to ease movements of people in the community. While speaking to Daily Sun, one of the landlords in the community, Aare Sakirudeen said before Semih constructed the bridge, they have been having challenges of crossing the river especially anytime it rains. “Our wives do afraid to go to other community because the river is dirty and inhabits dangerous creatures and diseases that many people have contracted because people in the communities have no choice than to walk in the river due to lack of pedestrian bridge. Also speaking, an old woman in the community, Mama Silifatu Sule said: “We learnt a son of Arisekola popularly called Semih gave us a new bridge in the community and was commissioned yesterday. “Before this bridge was commissioned, we did have challenge of crossing to the other community in this area because it is only this bridge that links the two communities. I pray God will bless the young man especially for following the philanthropic footsteps of his late father, Arisekola”, the old woman said.